... and the dragonflies, our largest insects - seen to wing and body measurements - are out flying. With beautiful autumn weather they are still active. The predatory dragonflies hunt their prey in the air; they have strong jaws and feet with spiny outgrowths that can form a basketlike trap. Thus they hunt insects in flight. 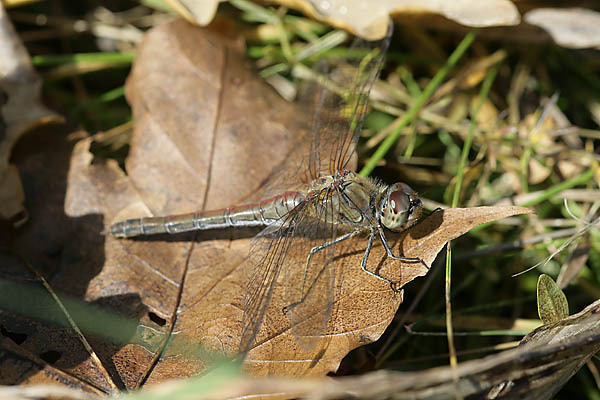 There are several similar species of darters or skimmer dragonflies; the body can be yellow, brown, red or black, with lighter or darker patches. The legs have yellow bands, the hind wings are broader than the forewings, "unequal wings“, as in the suborder name Anisoptera. 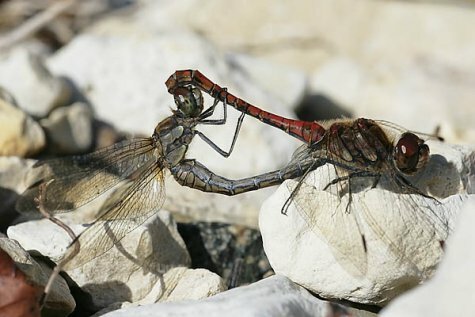 Dragonflies lay their eggs in water bodies. The next generation, the dragonfly larvae, or nymphs, live in water and are also predators, using a hinged "hunting mask“ with hooks that is thrust forward to catch a prey. Before emerging as adults the larvae moult several times.